by Seriously Star.In The Coach.5 Comments on Who Does That? On the morning of my flight home, I realized that during our day of shopping, I neglected to pick up a little something for The Coach. Probably wouldn’t have been a problem if I hadn’t made a point to tell him, “don’t worry, I’ll pick up something for you too” when he asked me what it was like to shop in NYC. My husband can be a little tricky to shop for so, I may have backed myself into a corner here. Luckily, I had a layover in Atlanta and they have some decent shops in the airport so, maybe I could pull off something nice for my guy. Hold on, am I really planning a shopping trip to an airport? I am indeed…my choices were limited. When I got to Atlanta, I jumped on the train to my terminal and headed to my gate. Surprisingly on the way, I found a shop that had some items I thought he would like and wear. I picked up a nice button down shirt and mentioned to the clerk that I was lucky I found the store since I didn’t buy anything for my husband while in NYC. The sales clerk said to me, “Make sure you take the shirt out of the bag so he doesn’t see the airport sales receipt”. 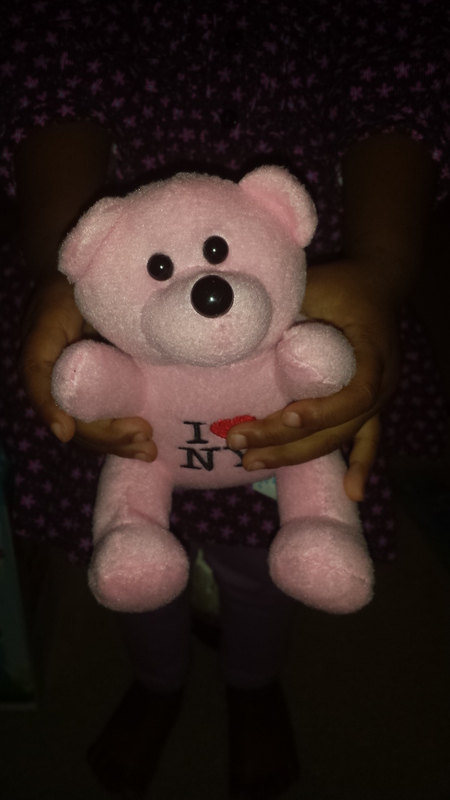 Once we got home, I gave Georgia Peach her gift (she is almost 2 so, a mini I LOVE NY stuffed animal FROM THE AIRPORT is cool). I did not put The Coach’s gift in my luggage, I kept it in the bag from the store, exactly what the sales clerk warned against. So, when The Coach brought in my luggage from the truck he asked what was in the bag. I told him it was his gift. He started asking me about the store. I must have forgotten who I married. The Coach: I have never heard of this store before, is it in NY? I really like the shirt, I wonder if they have a store close to us? Me: (Getting GP ready for her bath). I’m not sure of all of the locations (besides the one at Hartsfield-Jackson International Airport, Terminal C!). The Coach: Did you buy this shirt at the airport in Atlanta? Me: (Cracking up). Huh? What? Wait? What? How did you find that out? I walked back into the living room to I see him on the laptop, pointing to the name of the store and it’s location…the only one, Hartsfield-Jackson International Airport. Come ON! Me: (Still laughing). I mean, who are you?? Honestly, I ran out of time and had to make it happen. Do you like the shirt any less? And what makes you jump online and look up the store, anyway, who does that? The Coach: I liked the shirt so, I wanted to see if there were other things I might like but, I’m guessing the store is not big, since it was probably a kiosk. Funny. 🙂 It was an actual store, big shot. Whatever the people who always ask if THEY can ask you a question sell. Lotion? Timeshares? Nail Buffing systems? I don’t know. In the end, The Coach liked his shirt and will have to go to the designer’s website for more shirts with a similar style or he can just take a trip to Hartsfield-Jackson. Boom! Gotcha! Cousin done up and lost a step!!! Next Next post: Mommy, hugs?